Who doesn’t love soup especially on those cold winter days. Lets face it winter in Canada is snowy and cold but last week was a bit colder then I would like. 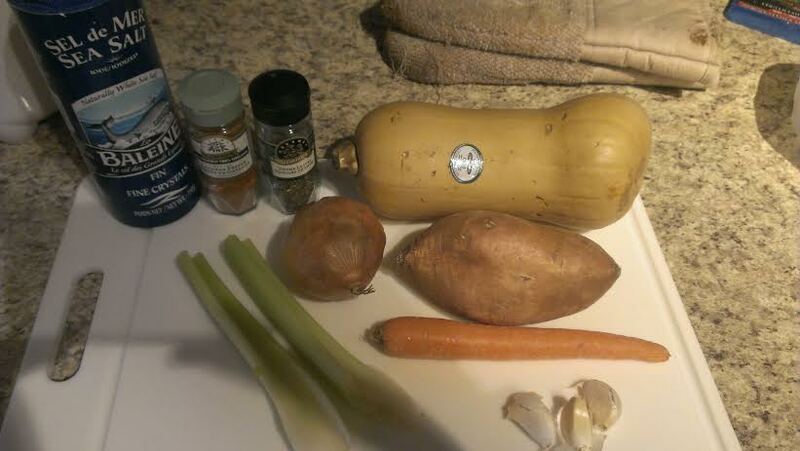 Soup was what we needed to warm us up from the inside out so a nice winter soup so that is what I set out to make. 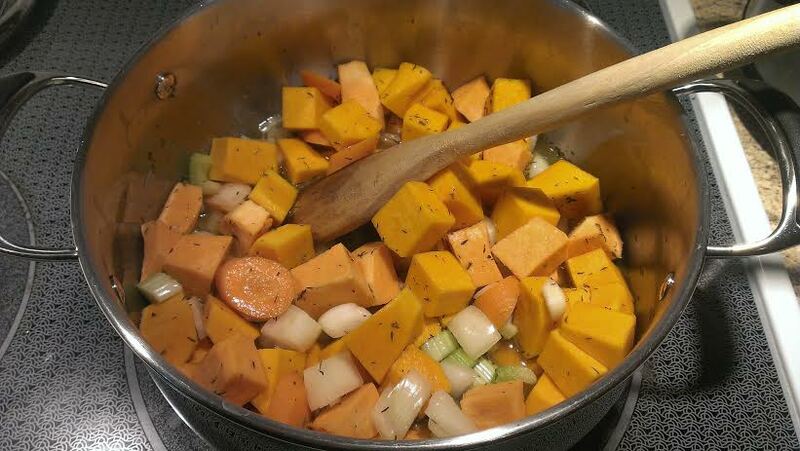 I had a couple butternut squashes in the cupboard and knew that with a few other winter staples I could make a yummy soup that hopefully all of us would enjoy. Most children on the spectrum have some sort of issues surrounding foods. It may be that they are extremely picky eaters. They may have a very specific way they need food to be prepared or presented. Some children will have issues sitting down long enough to eat properly and are constantly on the move. We are pretty lucky that the monkey will pretty much eat anything that we will give him. He loves most foods and is usually willing to try anything once and even twice before deciding if he doesn’t like something. I count myself lucky that I know he is getting all of the nutrients he needs pretty much every day. That doesn’t mean we don’t have issues with food however. Our issues with food stem from oral motor issues. The Monkey has to be constantly reminded to chew his food with his teeth otherwise he will mash things slightly with his tongue and/or swallow things completely whole. That means that we deal with a lot of chocking, his food needs to be cut up small, and pureed foods are our safest bet. This soup allows for a good dose of nutrition in every bowl but because it is a creamy soup it is super easy for the Monkey to eat without us worrying. It will be a staple in his lunches when he starts school that is for sure. 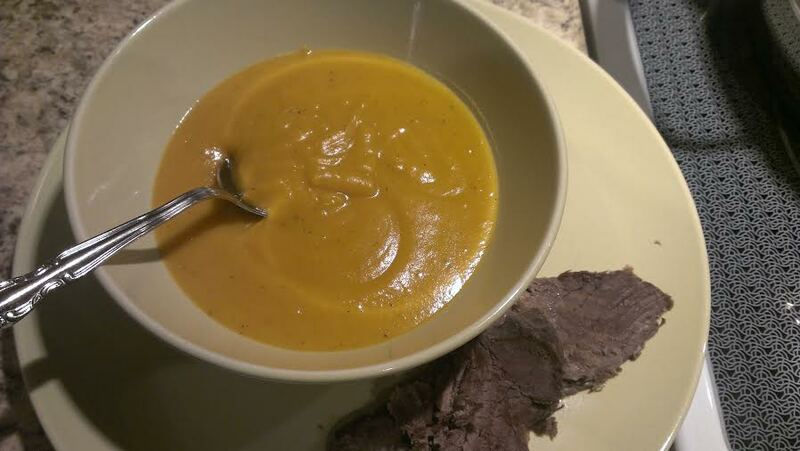 This soup is packed with Fall flavors and as I write this post it reminds me of autumn leaves and pumpkins, probably due to it’s vibrant orange colour. I hope you enjoy this as much as we did. It will be a staple in my house from now on. 1 can coconut milk – use the cream at the top only, discard water. Add all ingredients except the coconut cream to a large pot on medium high and bring to a boil. Once the broth is boiling reduce to medium low and allow vegetables to slowly simmer away. 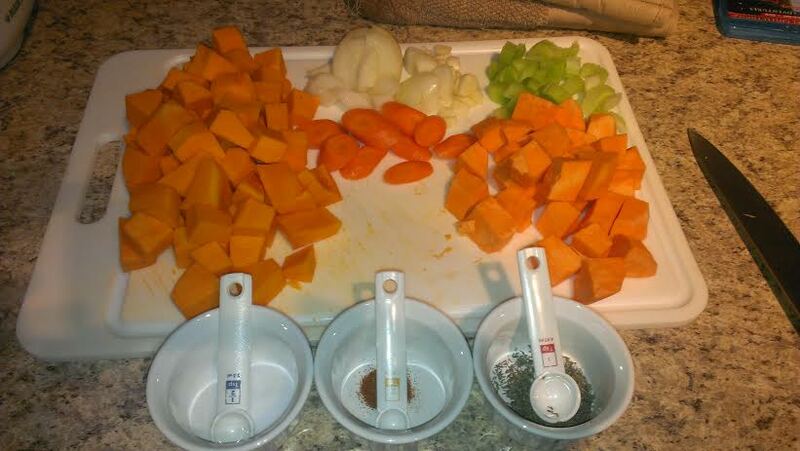 It takes about 20 – 30 minutes for all the veggies to cook depending on the size you have them cut. Cook the veggies in the stock until they are easily mashed with a fork. Once they can be mashed you will add the coconut cream to the blender along with the soup and puree. You can also use an immersion blender to do this and so you would simply add the coconut cream to the pot before blending. The coconut cream gives it a nice rich creamy taste and texture and you honestly do not taste the coconut. You can substitute milk of any kind or regular cream as well. Veggies all chopped and ready to go. Place all ingredients into a pot except for the coconut cream. Cook until the veggies are tender. Once the vegetables are easily mashed with a fork add the coconut cream to your pot. 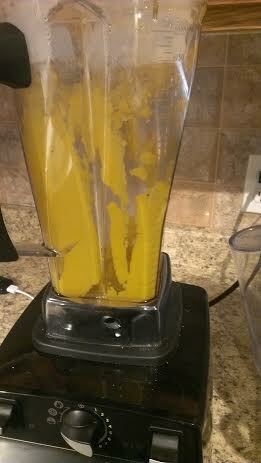 At this point you can either place everything into your blender or use an immersion blender to puree. 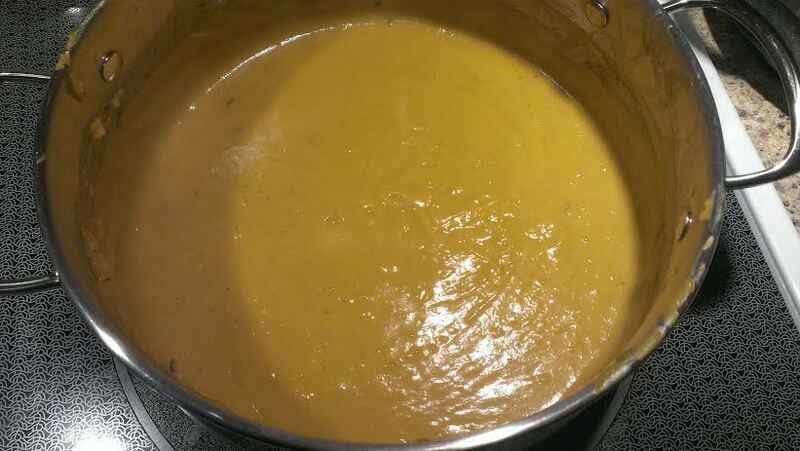 After the soup is pureed I pour it back into the pot and heat about 10 minutes before serving. This soup was delicious and the Monkey loved it. Even Gary, who doesn’t really like soup, said I should make this again and double or triple it so we have lots of leftovers. I would call this a success.